I'm Petri "Peter" Lahti, enthusiastic sport fisherman, born 1967. During the open water season I like to fish almost only by casting. In addition to casting tackle I like to use also flyfishing tackle. I have been fishing for several decades now, so I have tried quite a lot of different type of casting equipment. The affections to different forms and techniques of casting varies year by year. Sometimes jerk lures are thrown the whole spring season and sometimes the only thing what interests the most can be differently colored Lotto spinners. Sometimes I might even wake up at night and start to design new jig models. I have caught plenty enough fish over the years, but the passion for the nature have not started to show signs of fading out. 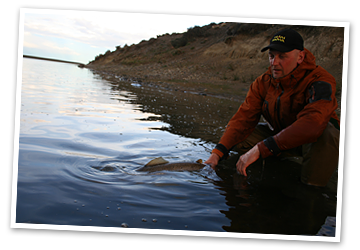 I have made several fishing programs for different TV channels over the years. I have also written fishing acticles e.g. to the Finnish ERÄ magazine. I have also worked as a fishing specialist e.g. on international sportsmen's fair at Riihimäki. At the moment big part of my time is spent for designing new jig models. I like to go fishing abroad annually. If I go fishing to new location where I haven't been earlier, I always try to hire a local fishing guide. I have met excellent fishing guides especially e.g. in Cuba, Gambia, Argentina, Iceland and Ireland. The most exotic species caught from those trips are e.g. tigerfish, tarpon, barracuda and deadly poisonous sea snake. The most special catch I have had here in Finland was the 12,3 kg zander, which was especially unsual in the sense since it was knocked by my boat. In addition to fishing I have another passion, football. Allocating time for these two sports has it own challenges, but both sports are just so marvellous that you can't live without. I hope you enjoy browsing the pages.